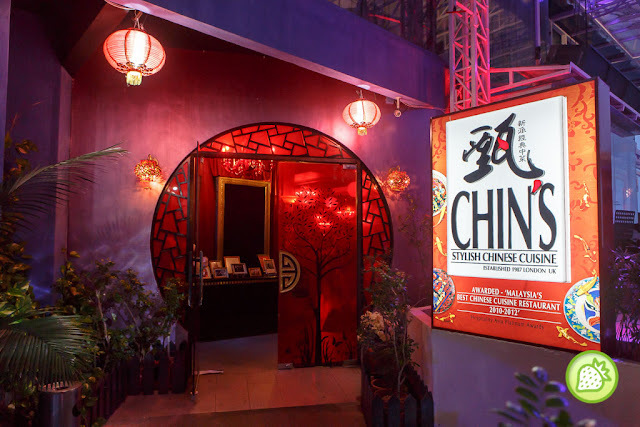 Being one of the award winning restaurant, Chin’s Stylish Chinese Cuisine is indeed one of the restaurant to visit. Bringing you with the great view overlooking the ferry terminals and ships; the restaurant not just a romantic place to visit but worthy in anyhow. 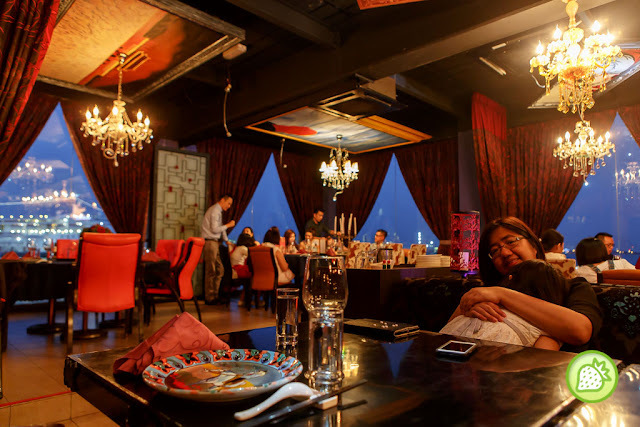 Located at Tanjong City Marina, Weld Quay, which is just next to Clan Jetty, beside QEII and they had also won “Malaysia’s Best Chinese Cuisine Restaurant 2010 – 2012” as well. CHIN’S first opened in London back in 1987 by a Malaysian entrepreneur, Mr. Dave Chin. This classy Asian eatery took England’s Food & Beverage scene by storm, winning two highly coveted and prestigious awards – ‘Best Restaurant of The Year’ by What’s On in London Magazine and ‘The Best Chinese Restaurant in UK’ by Stores Magazine, USA. Not just that, they had also won HAPA awards as well. Decked out in contemporary Chinese décor the likes of ornate lanterns and dark furniture, Chin’s is an exercise in lavish revelry and elegance, mimicking its flagship restaurant in London. With the unique deco on the walls and most of it are specially designed and imported from China too. 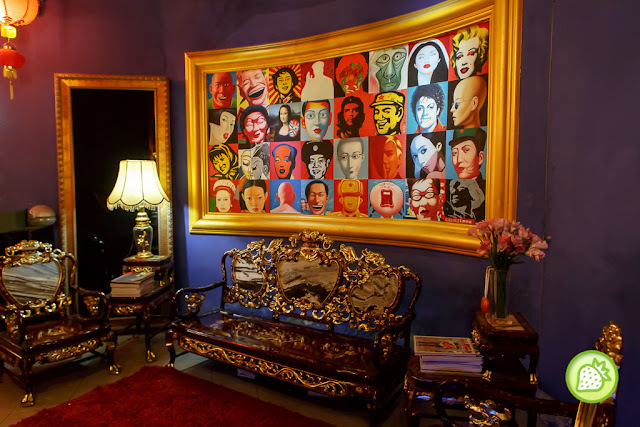 The beautiful arts which is rather unique, and modern is well mounted in the wall and walking pass you will be taking to a stunning interior as well. 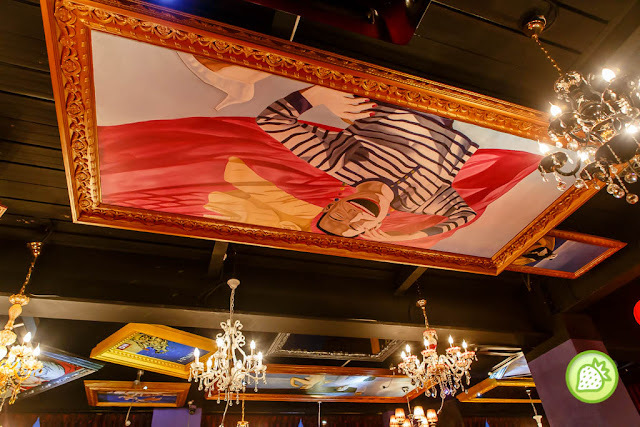 The interior is simply classy and with the modern touch where it comes with the chandeliers and also various contemporary art hung from the walls to ceilings. Not just that, even these plates are specially designed and imported from China. 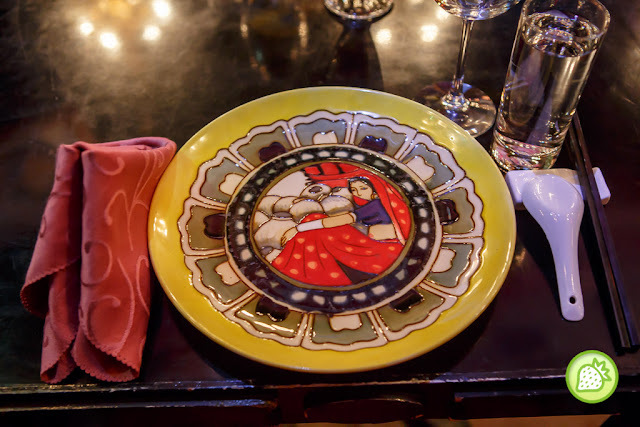 And as I understand from Mr Dave Chin, the plates are specially crafted by him and he had took the efforts of getting the right designer, to do them for him. 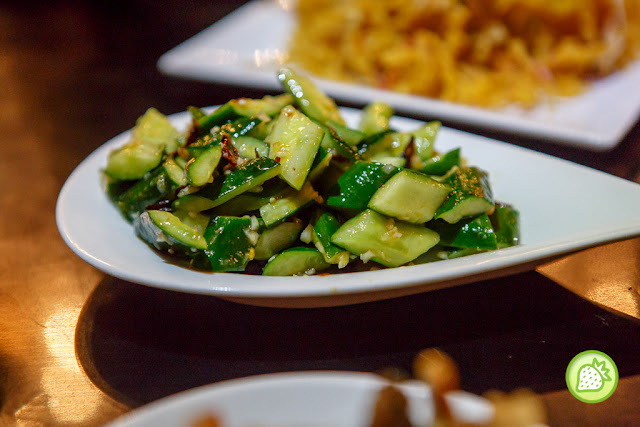 Enjoy the crunchy bites of the cucumber with the toasted of garlic and sesame and some spicy soy in it. It is indeed appetising and brings up the overall taste making you wanted to have more. The extra kick and the garlicly taste of it makes it even better. One of the unique dish of the night and yet deliciously good. 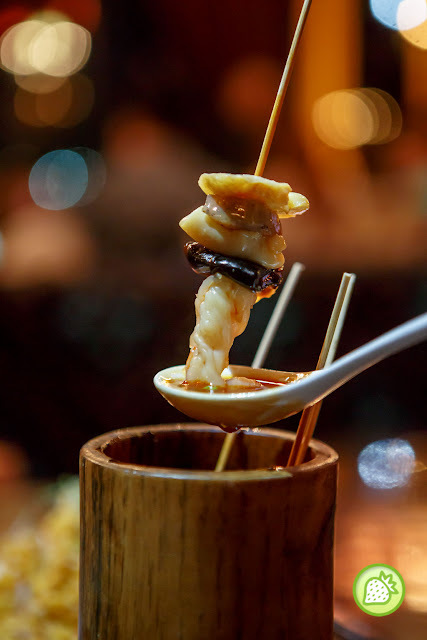 This is where the Blessed Joysticks comes with the Seashell meat, Baby Abalone and Sea Fungus dip in the hot boiled chili oil in a bamboo. 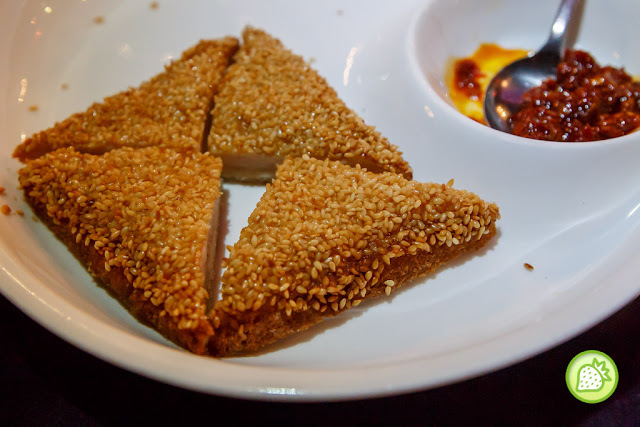 Enjoy one of the signature here which is the Sesame Prawns on Toasts where it brings you with the awesomelicious taste. 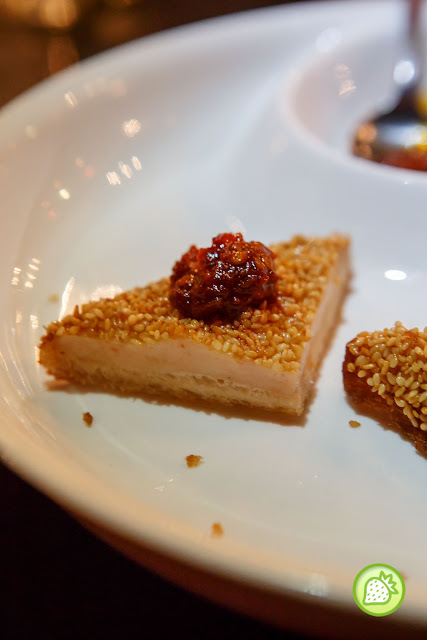 The prawn cakes which is coated with the sesame seed all over. Enjoy them with the dip of the spicy chilly thai sauce. Love it so much! 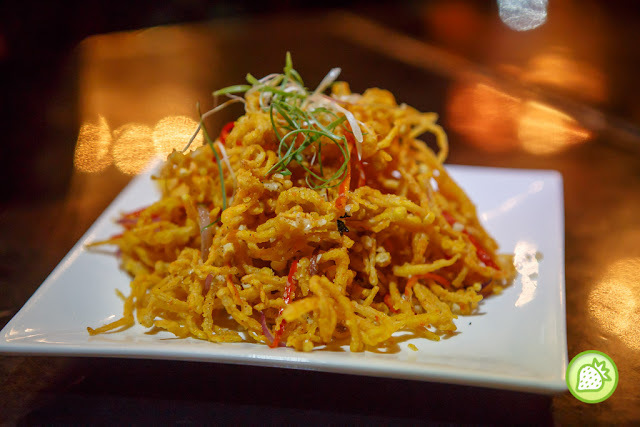 The golden mushrooms is being deep fried together with the inions, chilies and vegetable. Deep fried till crispy goodness and every mouthful is just heavenly. I am really impressed with this one. This dish is just awesome. I am a person who love spicy delights. Enjoy those flaming delights when is served. Comes with the hot and spicy sensation with a light sourish tang. Inside lays the bits of wintermelon, chilli slices, pickled chilli and of course, codfish fillets. 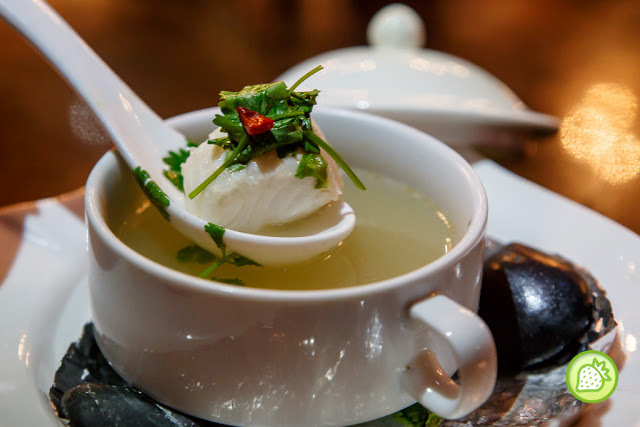 The cod fish comes deliciously nice where it is nicely cooked and brings you with the smooth and soft texture which it is indeed melts in your mouth. A must to try here. The quarter duck which is made in house and prepared for hours before being served. 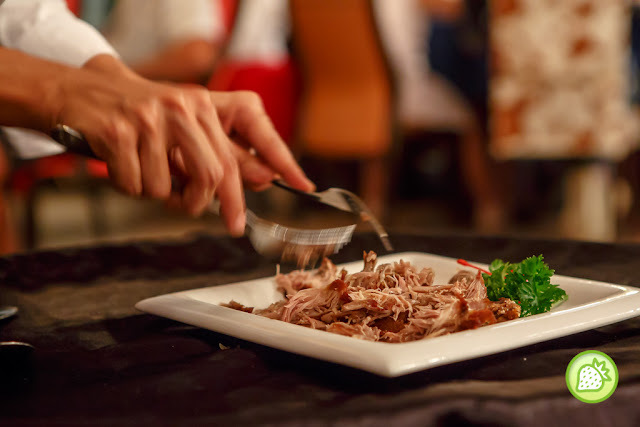 The duck had won many hearts and it brings you with the crispy skin and fragrant and tender meat. 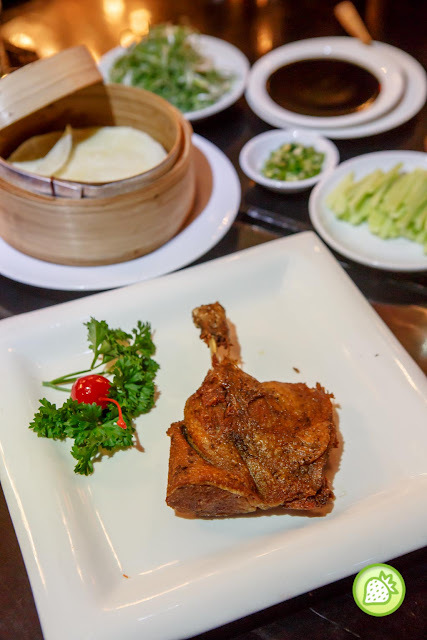 In here, the duck is served with the chopped green chillies, spring onions, cucumbers, and also Chin’s signature duck sauce. Served together with the crepes. It is perfectly a great indulgence and every thing is good here. I am impressed for sure and the taste was mind-blowing! Overall, we are impressed with the delicious delights served here. It is just a perfect location for awesome-licious delights with great view too.